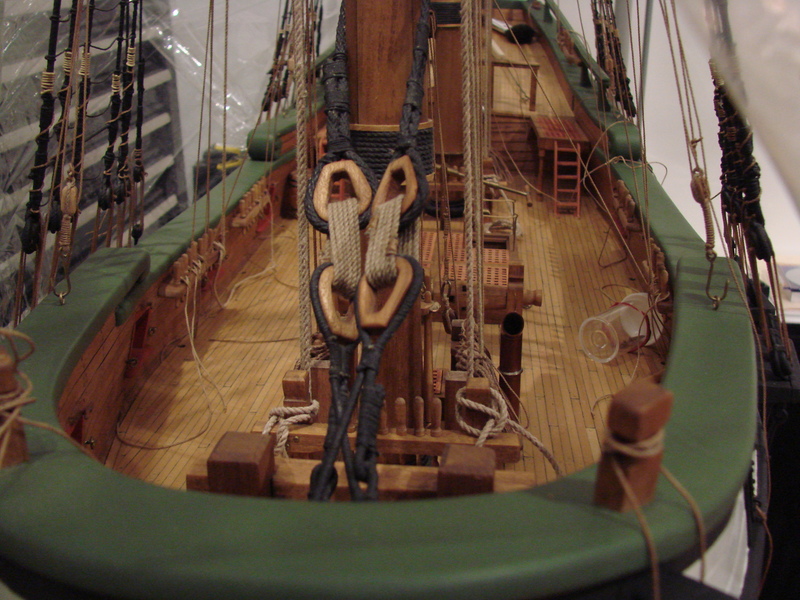 Bow view from waterline, 2009. Midship view from waterline, 2009. Stern view from waterline, 2009. 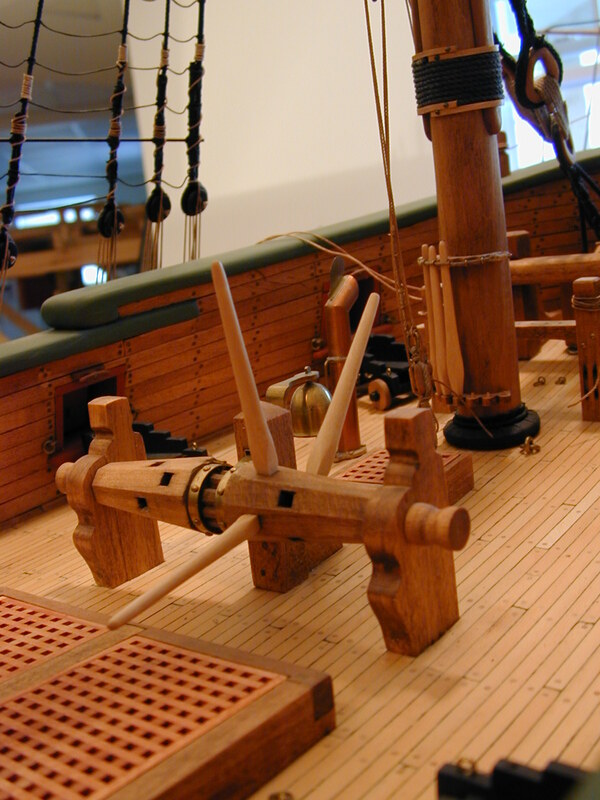 Fore mast base with bits, jeers, pin rail and main mast forestays. 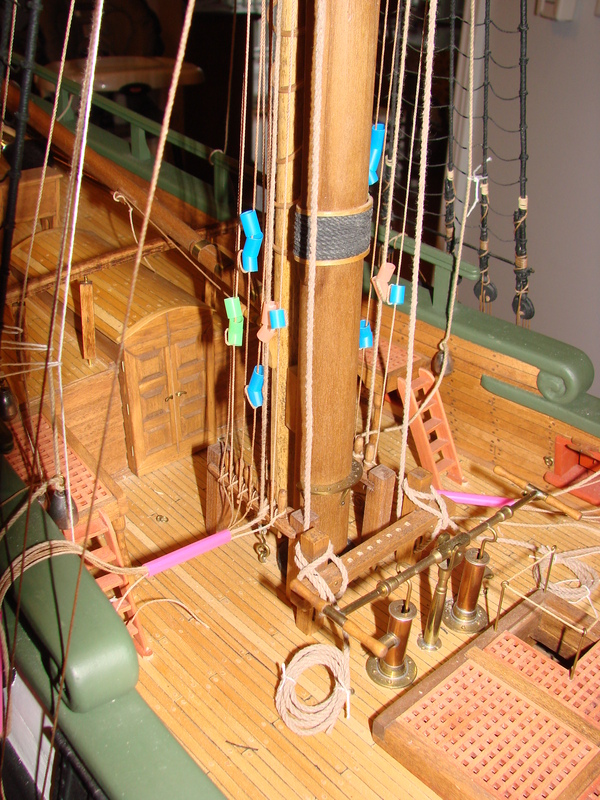 The colored plastic are bits of plastic drinking straws used to color code the lines while rigging the yards to the correct pin in the rails, 2009. 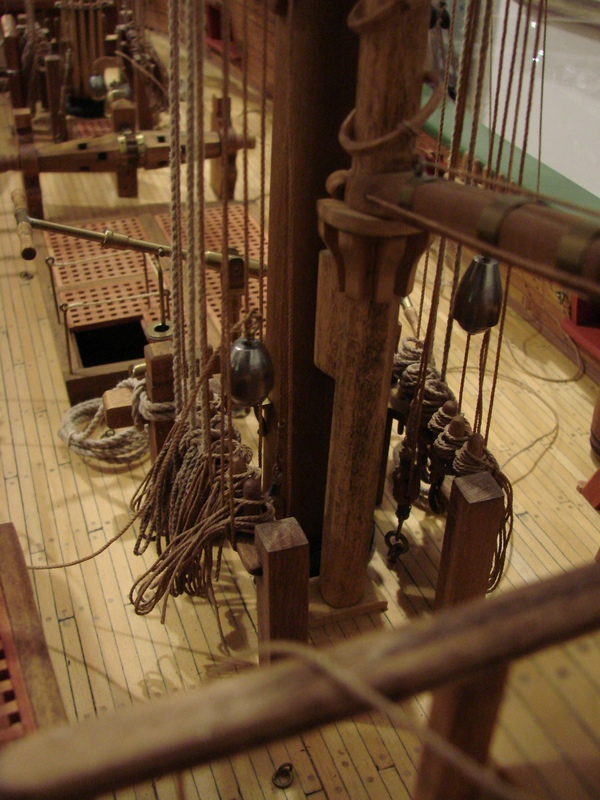 Main mast base showing main hatches, bilge pumps, jeers, pinrails, Captain’s cabin and poop deck ladders. 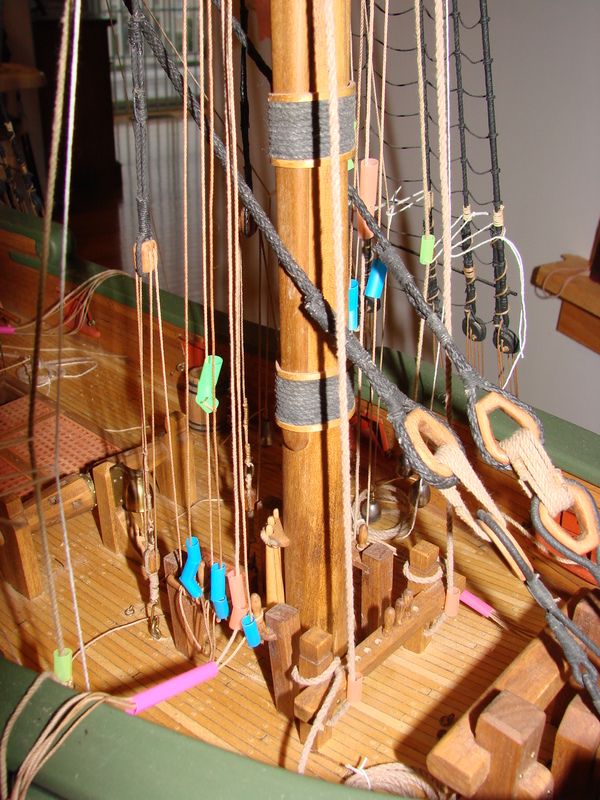 The colored plastic are bits of plastic drinking straws used to color code the lines while rigging the yards to the correct pin in the rails, 2009. 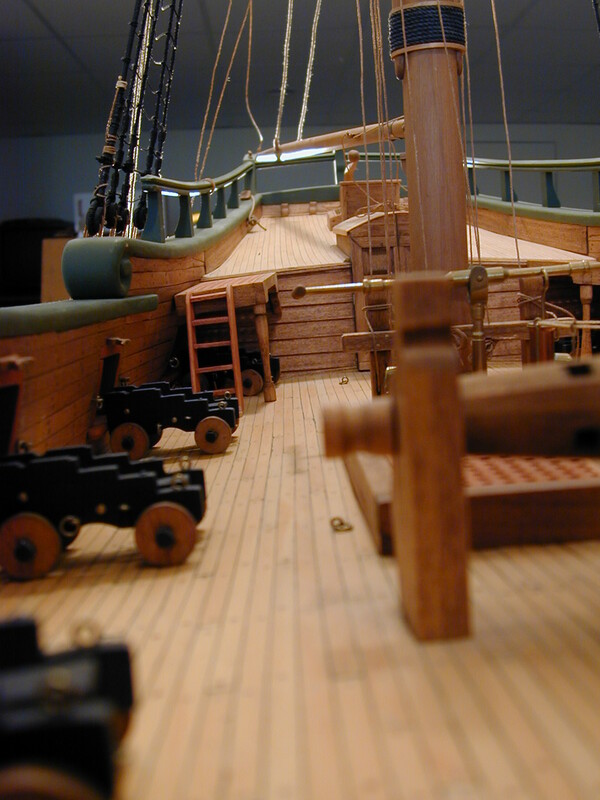 Main deck looking aft, 2002. 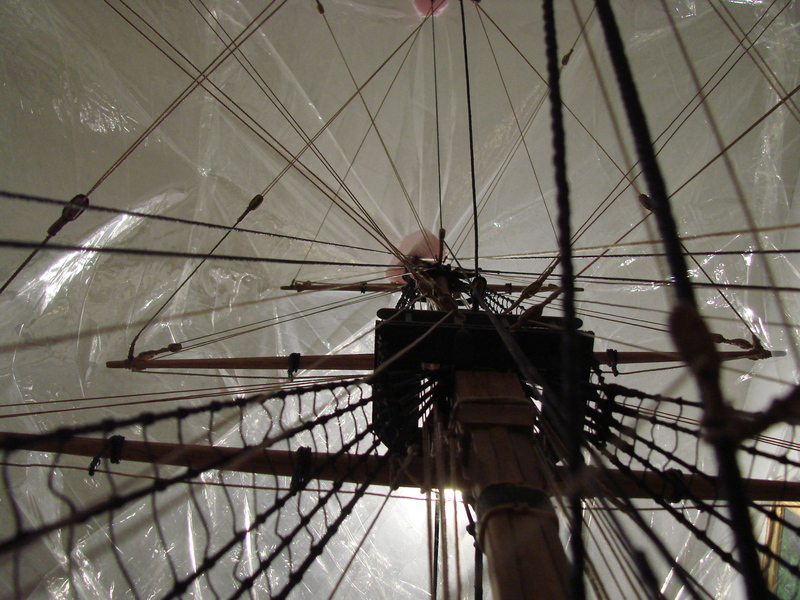 Poopdeck, tiller, binnacle and cabin skylight, 2002. 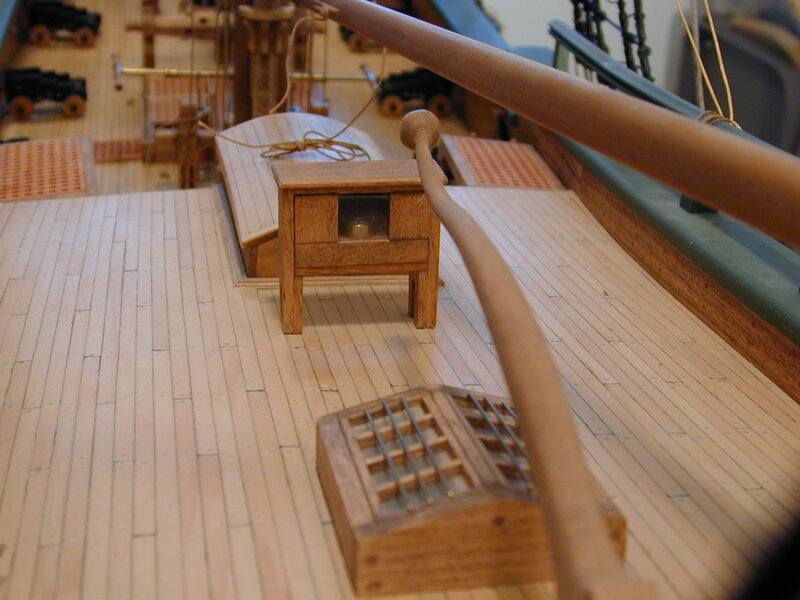 Foredeck, bowsprit, riding bits and bearding on the deck planks, 2008. I have completed 90% of the running rigging. Below are photos from April 2010. Bow view looking aft. Not the forestays and hearts. 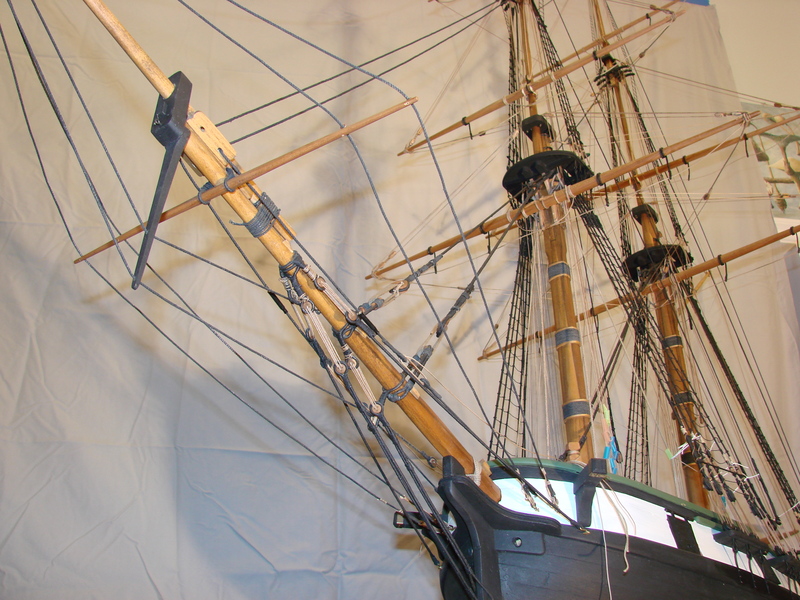 Pinrails have been added on the port and starboard bulkheads and most of the running rigging is in place. 4-6-10. View from the poop deck rail looking toward the base of the main mast. The braces and lifts are in place and I have started to coil lines on the pinrails. 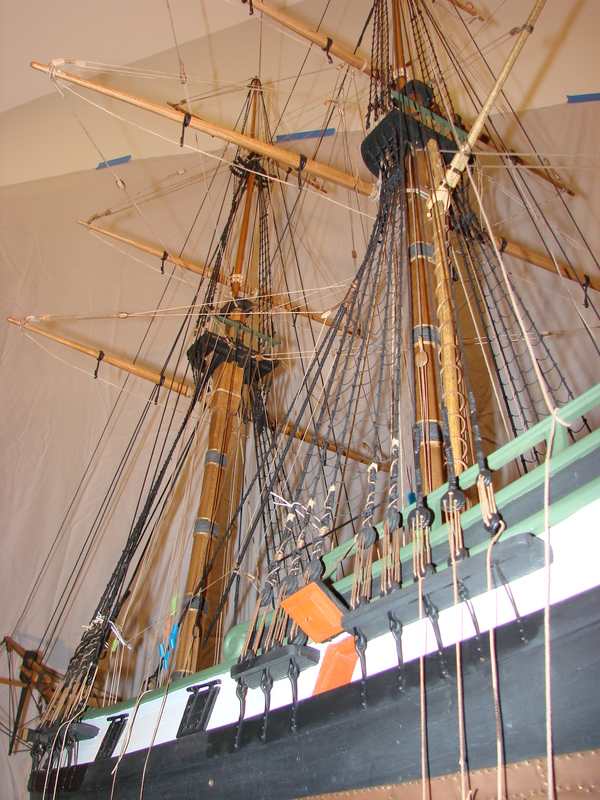 You can see the sister mast and boom behind the main mast. The fishing weights are holding the lines under tension during this operation. 4-6-10. 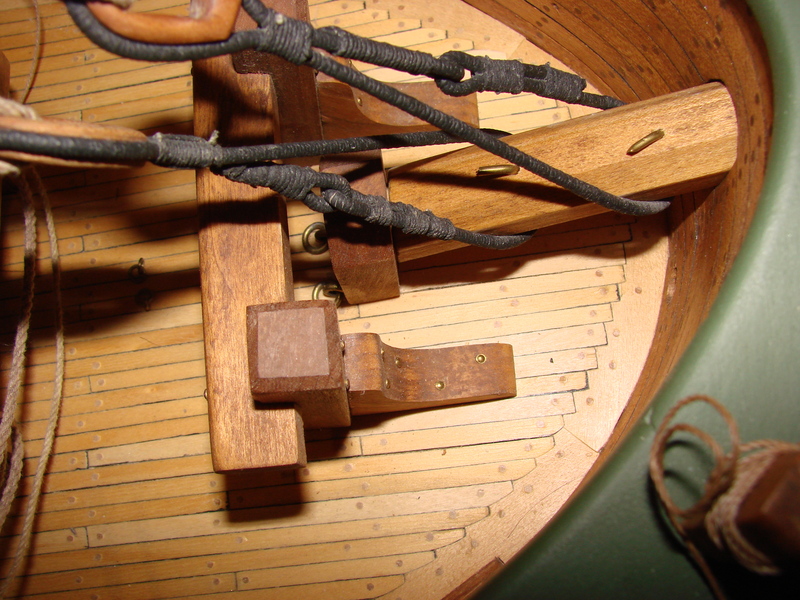 View from the base of the foremast showing the run of the braces. 4-6-10. These are the steps required in making the cleats. 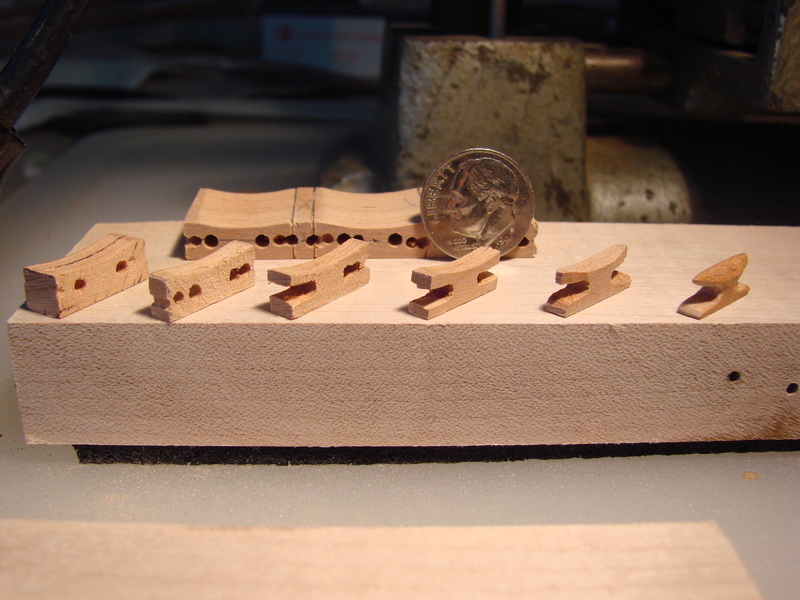 I use cherry for its tight grain and ease of carving. I’ll need a couple of dozen of these, and it could be tedious work, but made easier by mass producing them. I always make more than I think I’ll need and pick the best of the group before adding to the model. Each cleat will fit on a dime. 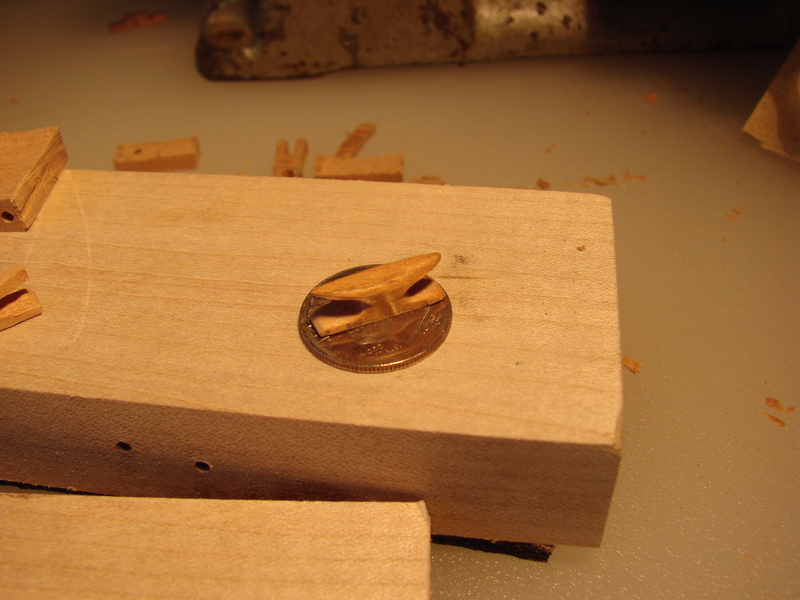 A newly carved cleat on a dime. 4-6-10. 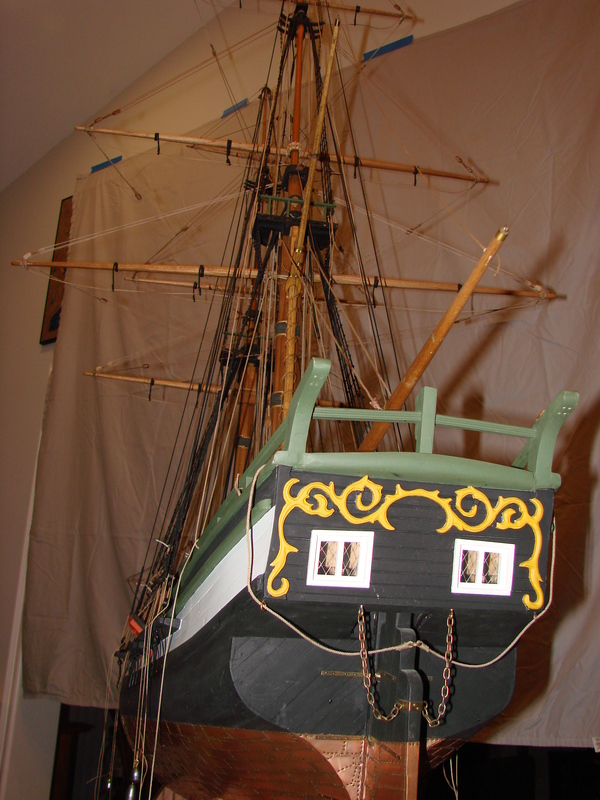 Once the running rigging is complete, I will start on the small boats which include the Captain’s gig, the launch and jolly boat. Three anchors and tackle are next, followed by turning and casting the cannon barrels. Mounting and installing the cannon follows this. 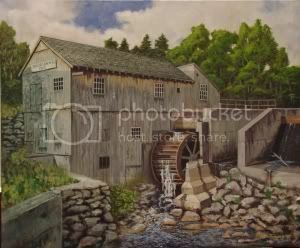 I have 1,700 hours to date and I think I’ll need another 300 hours to get all the remaining details installed. Stay tuned!